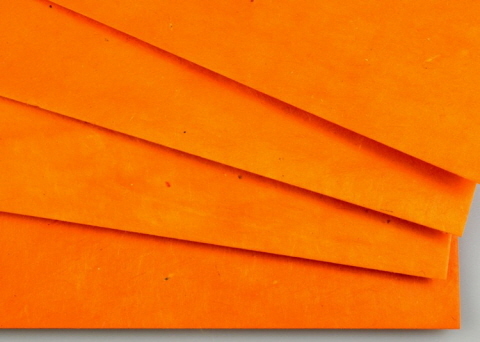 Vibrantly coloured Pumpkin Orange A4 computer for inkjet printers (pack of 25 sheets). This vibrantly-coloured lightweight 55 gsm lokta fibre paper is ideal for all your printing requirements. The printer paper has a smooth calendered top surface and a slightly less smooth reverse surface. We suggest that you use this paper one sided in laser printers but you may use it for two-sided printing in inkjet printers. A4 paper is 297 mm by 210 mm. This is a handmade product and the colours are approximate. They vary slightly between batches and may be displayed differently on different computer monitors.